Gold and silver futures snapped a three-session losing streak on Thursday. Gold rebounded to a 13-month high. Gold for April delivery gained $15.40, or 1.2%, to close at $1,272.80 an ounce on the Comex division of the New York Mercantile Exchange. The settlement was the highest since Feb. 2, 2015 when the yellow metal closed at $1,276.90 an ounce. "Safe-haven demand surfaced as U.S. stock indexes sold off and the U.S. dollar index dropped sharply in the wake of today’s announcement of the monetary policy easing measures from the European Central Bank," Jim Wyckoff, a senior analyst at Kitco Metals Inc., said in a report. The European Central Bank trimmed its main interest rate from 0.05% to 0% and cut its bank deposit rate from minus 0.3% to minus 0.4%. Gold prices ranged from a low of $1,237.50 to a high of $1,274.20. They slipped 0.4% on Wednesday, dipped less than 0.1% on Tuesday and lost 0.5% on Monday. Gold futures marked an earlier 13-month high on Friday but at a lower settlement of $1,270.70 an ounce. Silver for May delivery turned up 18.3 cents, or 1.2%, to end at $15.549 an ounce. Silver prices traded between $15.16 and $15.67. April platinum shed $5.10, or 0.5%, to $977.70 an ounce, ranging from $971.60 to $991. Palladium for June delivery added $7.80, or 1.4%, to $573.95 an ounce, trading between $559.15 and $575.95. Gold rose $20.10, or 1.6%, to $1,266.50 an ounce. Silver was unchanged at $15.27 an ounce. LBMA platinum and palladium prices are available on the LBMA’s website with a delay of midnight. United States Mint bullion products registered gains of 2,000 ounces in American Gold Eagles and 32,500 ounces in American Silver Eagles. The U.S. Mint this week limited its Silver Eagle sales to 1 million coins. The last of those were taken on Thursday and no more will be available until next Monday. Their cumulative sales hit 12 million coins, or 24.7% higher than through the same time in record year 2015. 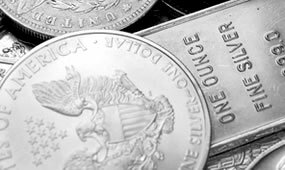 Below is a sales breakdown of United States Mint bullion products with columns listing the number of bullion coins sold during varying periods of time. A few of you have asked questions recently about the U.S. Mint’s silver, gold & platinum bullion version coins “Authorized Purchasers” who are the only 13 worldwide companies in only 4 countries who can purchase these coins directly from the U.S. Mint. If you are interested, I will post the official list I received from the Compliance Director of the U.S. Mint as of February 18. It may surprise you which companies are on the official, registered program list & which companies are not! Happy bullion coin collecting/investing everyone!